Retirement Daze: Smoky Mountains, Here We Are! A comment on my previous post by Dianne of the blog Schmidley’s Scribblings made me aware that I was guilty of something that aggravates me when I encounter it: references to a person, place, or event without enough detail necessary for identification or clarification. After all, if you are writing something and publish it, you are in essence issuing an invitation to a potential reader. In a June 26 post I mentioned a trip planned for the most visited national park in the United States. That was it, no detail about which park. I am regularly guilty of doing things that irritate me in others. At least it keeps me humble, except when I’m not! Okay, Dianne, that park would be the Great Smoky Mountains National Park in Tennessee and North Carolina, and that is where husband Walter and I are right now! Actually, we are in a coffee shop in Gatlinburg, TN, about 7 miles from Elkmont Campground where we have been camping in the national park since Wednesday, June 29. More to come! 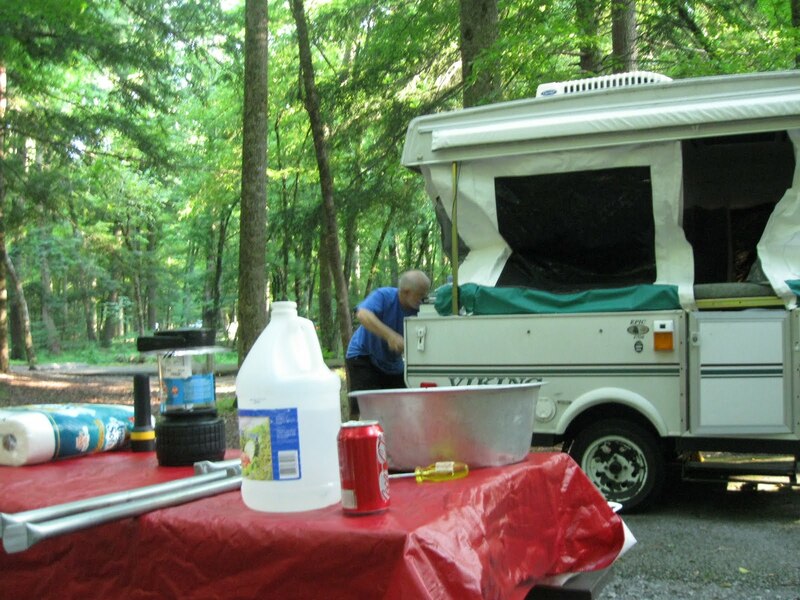 Husband Walter sets up our pop-up camper in a Smoky Mountain campsite. I hope it's not too hot and that you are having a ball! I look forward to pictures of the trip! Getting away is a good thing. I hope your trip is great. Please keep us updated because I've been talking to my husband about making a trip to where you are now visiting. Thanks for checking on me while on your vacation, I'm honored that you are thinking of me while you're away. I'm doing much better, now that my stress level is much lower. The ulcer seems in check, as well as arthritis for the moment. Unfortunately, some other members of our surrounding family have the ear/throat "funk" going around among them. I hope it skips me! Enjoy the rest of your vacation, can't wait to hear details when you return. Oh, I hope it is cool in them thar mountains. The Ozarks have seen no relief. Have a great time with cool weather and take lots of pictures. You are such a great role model for us all, living life as it comes to you and still doing what you enjoy. PS look at the photo on my site today of the Parkway in 1955. I'm so glad that you are able to enjoy the great outdoors. I love your pop up trailer. It really makes things convenient. The trees look so green and lovely! I haven't been on blogger much lately, but I'm happy to see that you are enjoying a vacation! You are quite an inspiration!